As the calendar rolls over to a new year and I’m putting the house back together from the holidays, I begin my own personal ritual of potting paperwhites. Typically I buy a few dozen of them for gifts and keep my own stash stored away to enjoy come January when it’s bleak outside and there’s no competition for my attention. This year’s blooms were stellar. I love having alllllll the nature in full view so I use clear vessels to plant the bulbs and small rocks to anchor them. This year I expanded and created a little window garden on a restaurant prep table covered with a drop cloth. It’s a serene little space that I find myself puttering around during the day. There’s nothing fancy or overwhelming growing here, just clips from my outdoor pots. I like to keep it simple. I keep my Japanese clippers, plant mister and plenty of vessels and cloches all piled up and happy here. Ordinary pansy’s from the garden center are a good fit for little bud vases and last about a week in fresh water indoors. Clear a space and create your own little window garden. It’s such a rewarding and easy little gift to yourself. Especially if you work from home. At this busy time of year, having all your wrapping supplies organized and handy is so helpful. At our recent Christmas styled shoot at The Vintage Round Top, we turned an old repurposed bed spring and table into a gift wrap station for wrapping up pretty packages, vintage style. 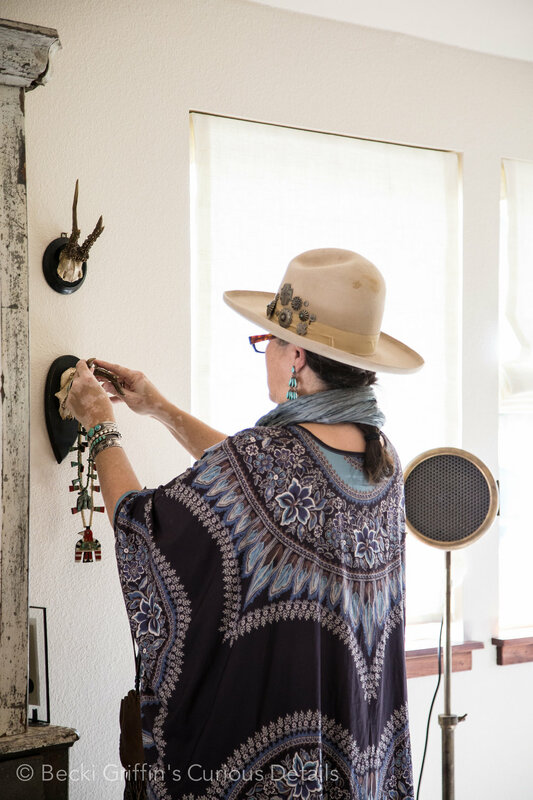 Owner, Paige Hull, is an avid collector of vintage textiles, ribbons and unique small objects that were easily repurposed for this project. The galvanized bucket that holds the wrapping paper nearby was originally used as a harvesting bucket, worn backpack style, to gather grapes. Sprigs of holly clipped to the bed frame can easily be snipped and tucked into the wrapping and vintage seaming tape makes perfect easy loose bows in soft colors. If you’re looking for unique one of a kind gifts, pop over to the the online shop at The Vintage Round Top. They’re always adding interesting antique finds from their travels, so take a look! 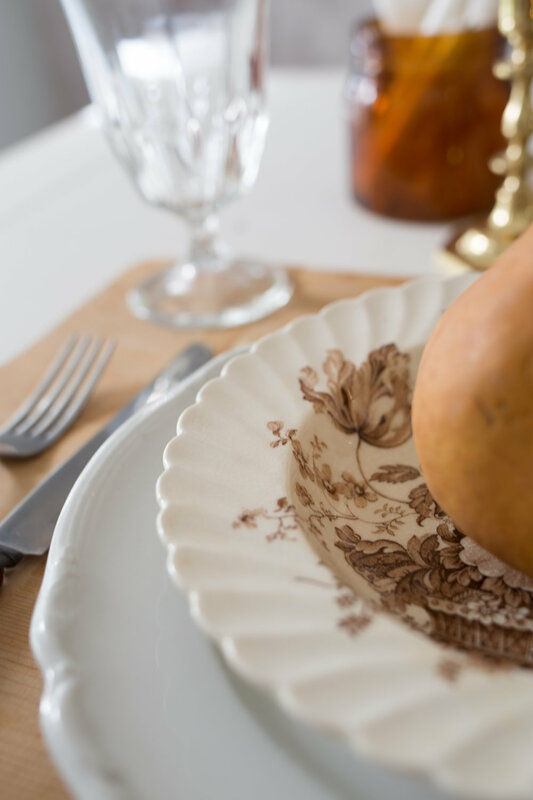 I’m pre-gaming my Thanksgiving table styling this week and pulling from what I already have tucked away here and there. It’s going to be light and airy neutrals, naturals, vintage and a little metallic. I had fun pulling from my prop stash to see which direction I wanted to go this year. Ironstone, brown transfer ware and brass candlesticks always play nice together and could easily make the transition to Christmas with simple greenery and berries from my favorite yaupon holly trees. I’m all about any styling that frees up time during the holidays and allows me to enjoy the season more with my family. The brown and cream swirl pitcher is Juanita Ware and was a Round Top find at the fall antique shows. It’s a mid century design made in the USA . I’ll be keeping an eye out for another piece or two. The natural colors and shape are so unique and I like to be able to use pitchers like this for stems all over the house. You can just catch a peek of the wall mural project I’m working on in our dining room. I can’t wait to finish it up and show you more of that. Pampas grass and wheat stalks are so pretty together. The ornamental grass plumes bloom this time of year and are pretty easy to find here in the Houston suburbs. Hit the thrift store for brass candle sticks. Retailers are charging high dollars because brass is having a moment but the thrift stores are full of good heavy brass for just a few bucks. No mixing seasons here at our home. We don’t decorate for Christmas until Thanksgiving is done and the last of the pie is eaten. A little slower and simpler just feels better for us. I’ve been away and it’s good to be back. There are seasons in life when our plates are so full of actual living that something else must be sacrificed. For me, it was blogging. The good news is all the big living that kept me away was good stuff. Our twins graduated from high school and are both away at college (did I just say that?) It’s true. They’re happy and doing well and my kitchen has never been cleaner. We miss them like crazy but they didn’t fly too far away so we see them every few weeks. My graduation gift to myself was to get away and spend a week with other artists on Cumberland Island, Georgia, with Pigs Fly Retreats, hosted by my dear friends and fine art photographers Lori Vrba and Anne Berry. The island is rich with history, wild horses, moss covered oaks and the ruins of historical mansions that once belonged to the Carnegie family. Our group was comfortably cared for at Stafford Plantation. Built in 1901 by Lucy Carnegie for one of her 9 children, the house was certainly deserving of a full house shoot, but our days were full exploring the island and photographing out in the southern wild of this remote barrier island. Doesn’t that sound like the best time? I do have some highlights to share with you. All week I had my eye on the home’s butlers pantry and knew I wanted to take the time to style it just a bit and give it a proper photo shoot. 10’ tall built in cabinets, drawers for silverware and linens. Beautiful old wavy glass and stacks of the family china (the estate is still privately owned). The copper work horse sink had a beautiful patina and dual faucets. There are no stores on Cumberland and all supplies and provisions are ferried over with each group. We were so grateful for the lemons growing out back to help flavor the island water. Truly organic and delicious even though they don’t look like perfect store bought fruit. We weren’t exactly roughing it but we were certainly grateful for what we had. The mudroom entry served us well. This is where we left our hiking shoes and backpacks. How about that perfectly peeling wallpaper? A corner of the master suite holds an extra bed and seating. A single framed seascape flanked by bare bulb sconces. Authentic, charming and timeless. Approximately 150 feral horses roam Cumberland along with flocks of wild turkeys that visited every evening for food. The island remains a wild and magical place. I have the pleasure of guest blogging over on Tripp Films this week and I'm talking all about prop styling for your business. Nikki Tripp is a Houston based videographer I've had the pleasure of working with recently on Old Glory Antiques branded video. I think videography is an exciting medium to promote business. I love the way it draws viewers in closer and allows more space for storytelling. Prop styling is an important component to a professional shoot and I'm sharing all the details of how I work on a branded shoot with Nikki. While you're visiting Nikki's website, take a look at her beautiful portfolio gallery and the services she offers. If you've been thinking about taking your business to the next level, your visual story is a wonderful place to start and invest in. I'm always happy to chat about your project! You can contact me via e-mail here. Life got you feeling some sort of way? Grab a pomegranate and enjoy the slow tactile delight of de-seeding this beautiful fruit. Ignore all those worthless how tos offering empty promises of quick de-seeding results. They lie. Give yourself the gift of time it takes to appreciate the color and textures of this mythical "apple with many seeds". This tutorial is the best way to de-seed and avoid damaging the arils. Add them to your Thanksgiving menu with this pomegranate relish, or these individual loaded sweet potatoes. For a lighter option, this delicious salad. Recently, I thought I had reached genius level pomegranate consumption status when I sprinkled some of the seeds on my morning peanut butter toast. It. Was. Delicious. A quick google search reminded me there are zero original ideas, but that I was in good company. Cheers to a beautiful pomegranate season! The other part of this truth is that I have put myself on a pretty tight budget this year (your welcome, honey!) Our boys are now seniors in high school and did you know college costs a bazillion dollars?! Do I think this is a pretty vignette? You betcha! Is it my dream dining room? Not even. But what I do love about it and all it's imperfections, is that it's the room in our home in which I have the most styling fun, and I like that. That feels really good. So, like I do, I turned on some good music while all the guys were gone, rummaged through accessories I already had (yes...I have a lot of stuff and I bet you do, too!) and got my fall groove on. The only thing I bought was a big bundle of bittersweet branches at the grocery store and a few pears for a little styling detail. The bittersweet is very long lasting (I know it's considered an invasive nuisance in some parts of the country, but wow...so pretty and wild!) Fresh flowers are for me like Starbucks might be for you. It's just part of the weekly spending. Total spent styling this problem child of a room for fall? $22 fun dollars. And I am really enjoying it. Dream dining room, I can see you in my future, just not right now. My friends Paige and Smoot Hull of The Vintage Round Top are so good at bringing together creatives and dreamers. Their fall workshop was a beautiful experience. If you ever get the chance to attend one of their workshops, my advice to you is JUST GO! 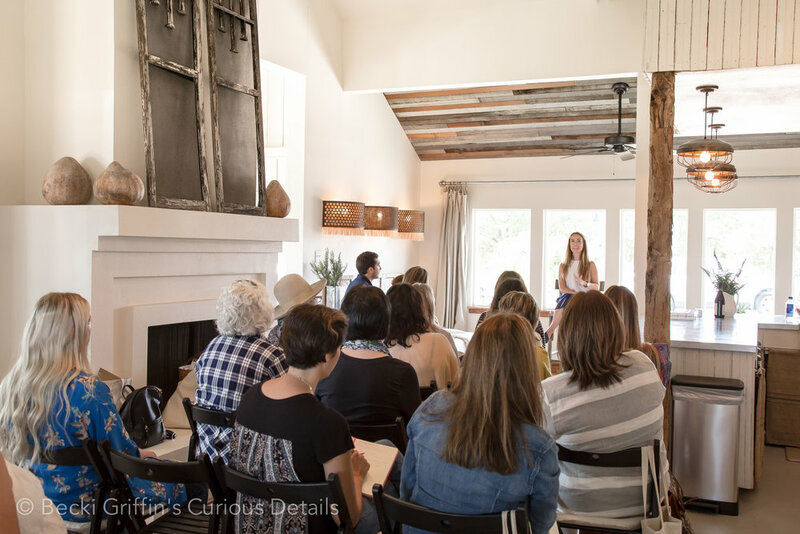 The workshops will inspire you no matter where you are on your creative journey. Having access to these successful creatives, listening to their stories and asking them questions is like jet fuel for your passion. With social media being the force it is in how we connect and conduct business, learning from the pros in a beautiful setting like The Vintage Round Top can be the thing that takes you to the next level. Just as the name promised, the workshop covered business, branding and social media along with hands on photography tips and an opportunity to apply what was learned during a styling session. How cool is that? Paige shared a detailed wrap up on her blog if you would like to dive deeper into the event. It's so important to never stop learning and workshops like this are a wonderful way to connect. The antiques shows in Round Top, Texas, wrapped up this week after nearly a month of shopping, socializing and sweating. It was a hot one! 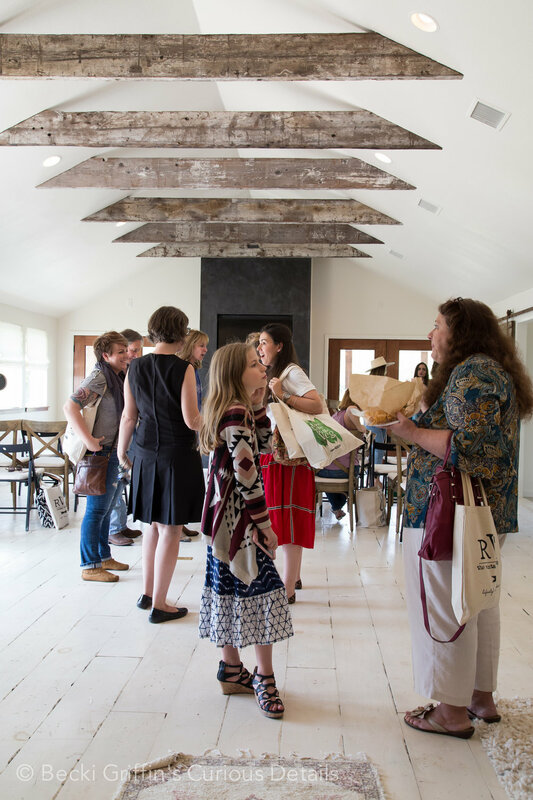 Luckily, my friends Paige and Smoot Hull of The Vintage Round Top hosted a very cool Business, Branding and Social Media workshop at their beautiful property in Round Top. I'm so excited to share more details about the workshop in a follow up post. But first, the styling! I collaborated with Paige to style a vintage modern table in the Boho Cottage for a private dinner for the panelists and workshop leaders the night before the big event. Layers of new and vintage textiles, candles, succulents, pretty glassware along with vintage elements Paige and Smoot gathered in Europe were the stars of the show. The bold graphic of the boho table runner from CB2 paired perfectly with Paige's antique tablecloths and brass apothecary canisters filled with eucalyptus. Linen napkins with the perfect amount of casual rumpledness from World Market. We recommend NOT ironing the napkins...who wants to do that anyway? There's a party about to bust out! If it's in the budget, I love to use colored barware to kick things up a sparkly notch. The shimmer of the soft gold glasses made the evening feel extra special. Stylist Tip: Candleholders work great as small planters for table styling. The geodesic tea light candleholders are from CB2. They were perfect to tuck in between the lanterns. We used two different modern brass style lanterns at varying heights. See both styles here and here. What a gorgeous space! Round Top is certainly packed during antiques week, but if you've never visited when things are quiet and normal then you're missing out. From Houston, it's an easy relaxing drive that takes just over an hour. There are a few new restaurants, galleries and my friend Holly Kuhn has reopened Old Glory Antiques in a stunning new space I'll be sharing soon. And that's how we created a vintage modern mix for a fabulous evening with inspiring creatives. Stay tuned for more details from the workshop! Earlier this summer I talked with Zandra and Karen of Little Yellow Couch and hosts of the Style Matters Podcast. We had the best time chatting about my work as a prop stylist, decorating and the fear that comes with making design choices, thrift stores, crappy art and we even went deep with the question "why does style matter?" These ladies know how to ask good questions and kept me on my toes. We kept coming back to the conversation of how fear can be paralyzing. It's a juicy convo but one that I hope will inspire you to not take your choices so seriously. It's just decorating! Click the arrow above to listen to our Style Matters podcast. Have you ever been so delighted in your decorating choices that every time you walk in a room you're smacked in the head with joy? This is now happening when I walk into our master bedroom. We're just back from summer vacation and I've gone all in with my favorite place/vibe/dream and have covered the wall in coastal paintings. Some vintage, some painted by me and one sneaky poster print. It was time for a little refresh in our bedroom and I didn't want to spend much so I gathered my paintings and started a gallery wall. I want to mention our master bedroom is on the small side but the paintings don't overwhelm the room at all. It gets tons of pretty natural light and I've kept most of the room neutral. Don't be afraid of installing big art in a small space. I hit up HomeGoods for night stands. By some lucky miracle there were two matching night stands at the same store (you know that NEVER happens) so I grabbed them right away. I stripped the bed and simplified by removing some of the decorative pillows and adding a light cotton summer blanket. I did splurge on one big beautiful linen pillow by Pine Cone Hill that I picked up at Kuhl-Linscomb in Houston. With the wall now being a bit beachy bonkers, the bed needed just a little color and simplicity. One big soft blue pillow was all it took. I've been really lucky finding coastal paintings for ridiculously cheap prices. I think it's because of the amount of shopping I do as a stylist. It just naturally puts the odds in my favor that I'll find a deal. The painting in the image above right was $1.00 (don't hate me). There are actually two on this wall that cost $1.00. The other was coated with a think layer of tobacco smoke scum I had to scrub off but was worth it. The abstracts are palette knife paintings I did myself. The only framed piece came from my friends at HASbins (top right corner). I do have one cheater piece (top left corner, also from HASbins). It's a thick poster print that was originally a store advertisement. The colors and dimensions were exactly what I needed to finish the wall so I'm using it as a place holder until I stumble upon a painting or paint one myself. It doesn't bother me a bit that it's a poster. I love the moodiness of it. I removed the wall mounted lamps I had previously and replaced them with some trendy brass and marble task lamps from Target that I found on clearance (the website has them at full price now, hmmm). I love that they're adjustable and have built in dimmers. The play of the modern lamps against all the vintage is nice as well. It's all about the mix. This room is officially freshened and done. Until Christmas anyway. Just a very small portion of the spoils of a greedy collector. The tip of the seashell iceberg here. I've amassed so many shells over the years that I've had to reign it in a bit. Too many cabinets loaded with boxes and bottles full of shells from vacations and day trips. This restriction doesn't apply to sea glass though. There's always room for more glass. As I was styling this vignette for the 4th, I ran across my copy of Anne Morrow Lindbergs "Gift From The Sea". Written in 1955, Anne used shells for inspiration as she reflected on the life of American women. "need not be an enormous project or a great work. But it should be something of one's own. Arranging a bowl of flowers in the morning can give a sense of quiet in a crowded day-like writing a poem, or saying a prayer". These shells are my own. Layered in with botanical specimens and my own palette knife painting of the California coast from a few years back. A sailors hat and a silver tray to hold sailor's valentine souvenir boxes. Happy 4th of July! May your own pockets be filled with the weight of gifts from the sea. My spring work season has been a busy one, just like I like it. A nice big flurry of projects before the slower days of summer. 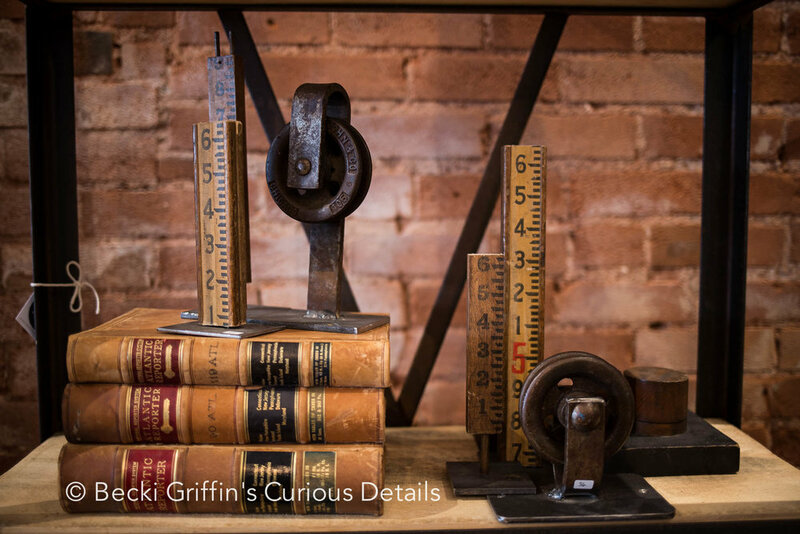 I recently made my 3rd annual trip up to Denver to photograph Old Glory Antiques for owner Holly Kuhn. Spring has officially sprung in Denver! Holly's style is hands down one of my favorites. 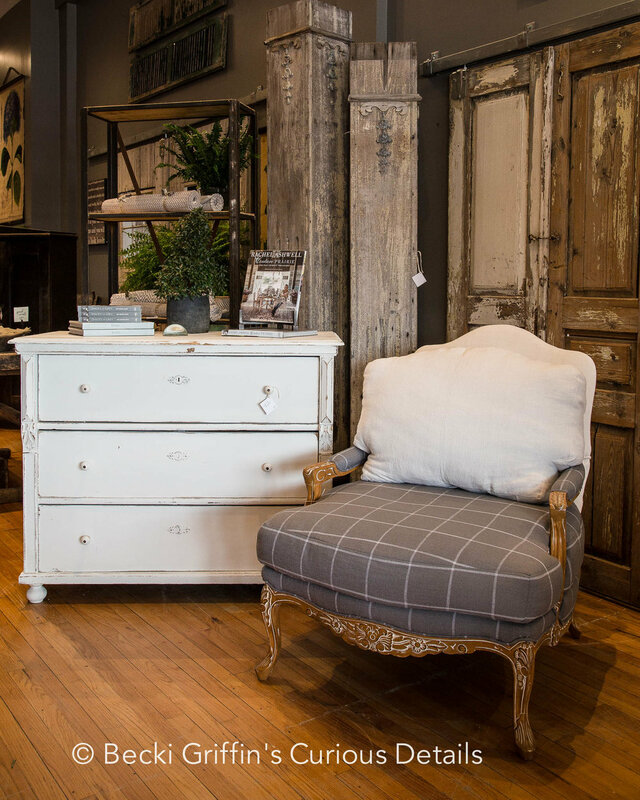 She mixes beautiful American antiques with large scale art and just the right amount of accessories so that one isn't visually overwhelmed and can easily envision how each piece might work in their own home. The fun starts at the front door with these whimsical glass vessels displaying vintage silverware. How many great ideas are running through your mind of how to play with these? I especially love them on that gorgeous farm table. 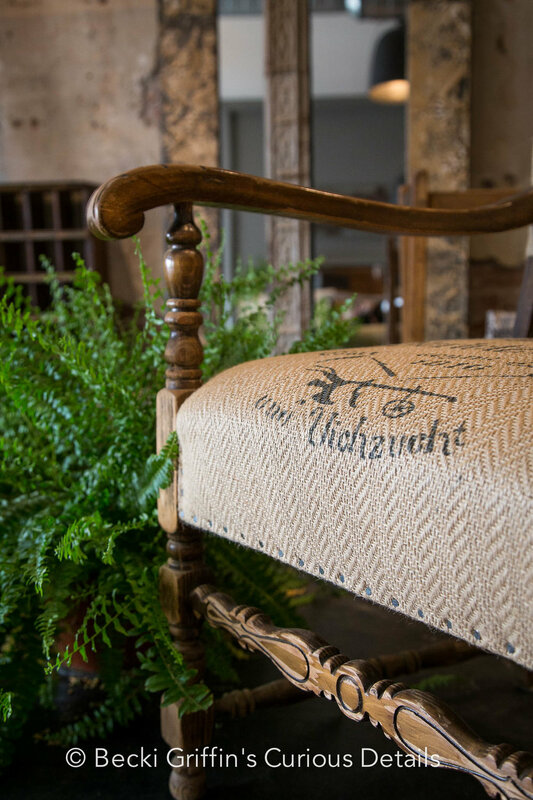 Holly keeps a great selection of custom chairs, many one of a kind, with beautiful fabric details. As a stylist, you can only image how I go a little bonkers over the accessories at Old Glory. A little patina, a little texture and that collected over time look, hits just the right note. Inventory moves fast at high altitude so checking in often is the best way to get that special piece before it's gone. This trip was made even better because I teamed up with my friend and colleague Holly Mathis to also work on a little side project while we were there. Old Glory Antiques owners, Holly and Brian Kuhn, recently moved to a beautiful new home and invited Holly and me to come for a quick fluffing session ahead of her son's upcoming wedding. The Kuhns had just moved in two weeks prior and were to be hosting extended family so we kicked it into high gear and fluffed guest bedrooms and living spaces. The biggest and best news I have to share is that Old Glory Antiques is coming back to Texas! I don't think I've been this excited about a store opening in a very long time. Old Glory Antiques is currently under construction in Round Top with Holly Mathis working on the details locally while Holly Kuhn is holding down the fort in Denver and gathering the inventory for the Texas store. The exact opening date is still to be determined and as soon as I hear something solid I'll shout it out. You guys...it's going to be so good. As soon as I get the "ok" I'll share a few sneak peeks of the inventory. Until then, if you're in Denver stop by Old Glory at 1930 S. Broadway. The April 2017 issue of Country Living Magazine features the beautiful home of my friend Holly Mathis and it is soooo pretty! 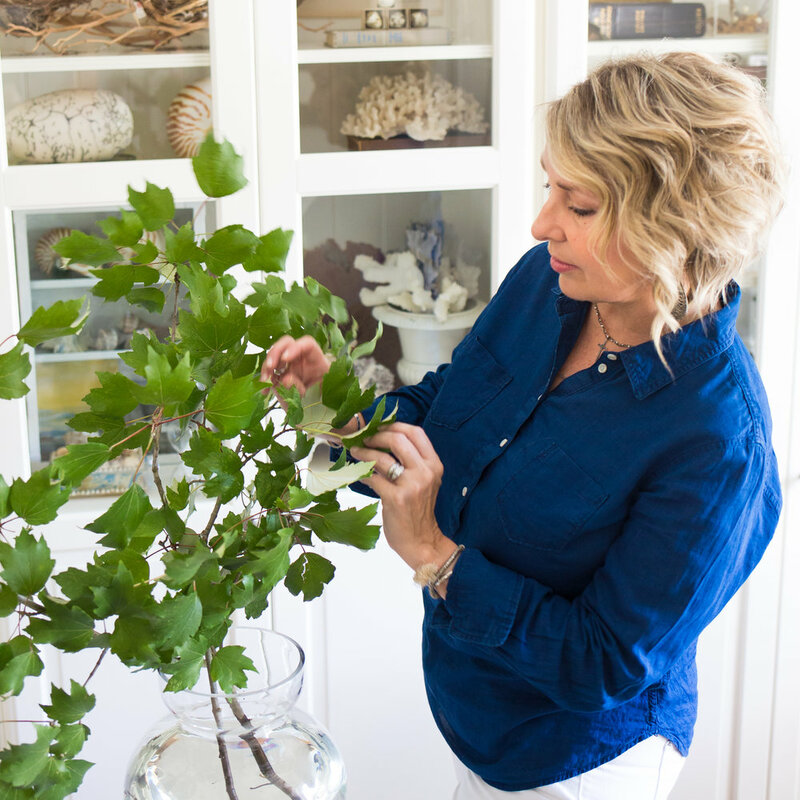 I was thrilled to have the opportunity to style the home for the magazine and so excited for Holly to get the opportunity to share her inspiration and offer a crash course filled with advice for designing a beautiful home on a budget. This lovely little 1890's cottage was a soft place for Holly and her two boys to land as she was starting a new chapter in her life as a single mother. I'm so proud of the home she created for her little family. It's filled with cozy but practical design ideas for moms and boys, like the beautiful linen slipcovers from Bemz. I thought it would be fun to share some of my behind the scenes iphone shots from this shoot and tell you how Holly and I met. I love a good dog on set. Hunter is quite the charmer and takes good care of Holly and her boys. Just when I thought it couldn't get any better, I spied Holly Mathis sitting behind me in her signature blue jean jacket. It was like seeing a movie star in the grocery store! I had read her design blog and admired her work, just like you guys, and I couldn't believe she was sitting RIGHT THERE! So, during the meet and greet I worked up the nerve to introduce myself and we hit it off right away. Just a couple of designing ladies sharing our admiration for Carol and enjoying lunch on a beautiful day in Round Top. Styling detail of Holly's antique secretary from Leftovers Antiques in Brenham, Tx. Fast forward 5 years and we're standing together in her living room as it's being photographed for Country Living. I love how life, and God, works like that. Blue and white styling options for Holly's shoot from Kuhl-Linscomb in Houston, Tx. I've had the pleasure of working with Holly quite a bit over the last 5 years. 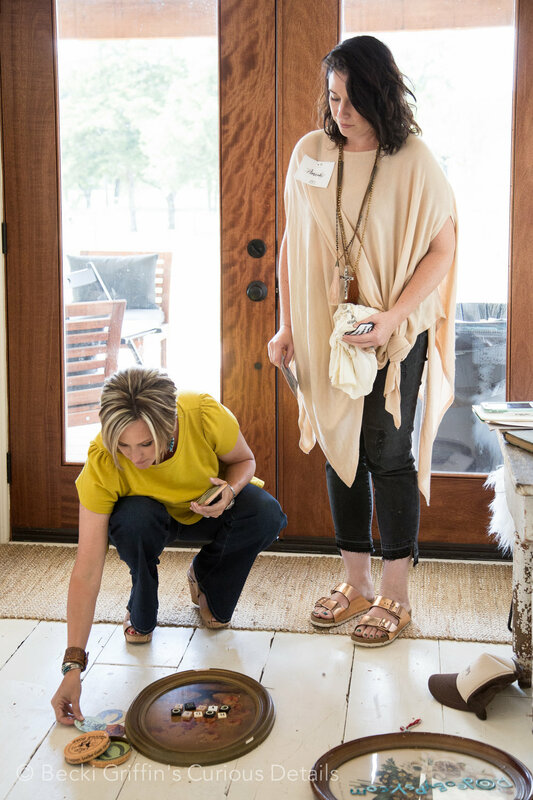 She's been a divine source of inspiration and has generously invited me to ride shotgun on a few of her projects, like the Old Glory house design project in Burton, Texas, which was also featured in Country Living. Detail of dining table styling with classic blue and white pitchers. There are so many great resources in the story! Holly knows her way around fabrics and lighting and antiques like no other and she's spilling it all. Everyone deserves to have a beautiful home at any price point. It can be done! Love this vignette at the end of Holly's hallway. So pretty! The story is on news stands now and is the perfect nudge if you're looking for inspiration for spring. Three and a half years ago I got a frantic call from Paige at The Vintage Round Top. It was just before the fall Marburger Farm antique show was to open during Antiques Week in Round Top and she needed a stylist asap to help with the booth styling. We had never met, but I was available. Our styles meshed wonderfully and I love a last minute adventure, so I said an enthusiastic "Yes!" This was no ordinary flea market booth. It was a full on production with custom lighting, a vintage circus theme and a beautiful inventory from their recent buying trip to France. Rarely do you shop at an antiques show where so much thought is put into every detail to create a shopping experience as unique as this. I was invited back to assist with the spring show booth as well. Paige and I love a good style story so we created a booth that was a nod to an unknown French naturalist who we think would have fit right in with our squad. Sometimes you create your own story and magic. Those are the best times. These shows were just the beginning of a wonderful personal and professional relationship that has resulted in many collaborations, photo shoots, magazine features and thousands of phone calls and belly laughs. Yes...thousands! Me and Paige junkin' in Brooklyn, NY, recently. We get around! And speaking of pretty, I'm so excited about the new cottage that's being built at The Vintage Round Top. The Boho Cottage is part of an expansion of the 1450 Cottage and is stunning! The "great room" at the new Boho Cottage. Perfect for events and workshops. I'm so excited to be part of the workshop panel, along with Travis Weaver of Manready Mercantile, Jordan Breal from Texas Monthly Magazine and social media influencers and photographers Hunter Lawrence and Sarah Lawrence. You can read more about the workshop here. If you missed out on workshop tickets at Boho Cottage, the same day there will be an open house and Pop Up Shop held at the 1450 Cottage. If you've always wanted to see their beautiful vacation home in person, this is a great opportunity to walk through and shop their artisan made home goods, unique vintage finds and European antiques which will be for sale the same day as the workshop. Also, I will have my wood panel art on site and will be taking custom orders. It's a great opportunity see see these Texas cow prints in person, so be sure to bring your measurements with you! Here's a sneak peek of a new piece that's coming to the web store in just a few days. Meet "Loverboy". This painted pony is such a beauty. And he knows it. I was told his good looks often made up for his bad boy behavior. We've all known one of "those", amiright? If you missed out on tickets to the workshop, I hope you'll stop by the pop up shop and open house and say hi! Come enjoy a fun weekend in the country and shop the shows in Round Top! We speak so often of our homes telling a story, that sadly, it's almost become a cliche'. I do sincerely love the thought and apply it to my clients and my own home. It's one of the first things I love to chat about with new clients...their lives and how to bring the proof of their lives into their homes . I think that matters. What's more original than your life and how you live it? When Christmas was done and the decorations put away, I felt twitchy about our dining room. I've been patiently waiting on the "just right" cabinet to show up for the past year and it hasn't happened yet. It needs to be big and accommodate collections and props and serving pieces and textiles and silverware. Not too pricey, not too trendy, not too small. Jussssst right to suit this Goldilocks. Then I remembered, in the rafters of our garage was a pine shelf we bought during the first year of our marriage when we lived in Connecticut, 29 years ago. My memories of this shelf play like a flickering 8mm home movie. I've used it in every house we've lived in in one way or another but I had never brought it into this house. I remember finding it in an antique shop and forking over a whopping $50 for it. I loved the pine and way it smelled. It's heavy and always needs big screws to secure it to the wall and it leaves big holes when it's taken down. I don't care. I love it. We hung it over the stainless steel restaurant prep table I use as a buffet and filled it up with the things I love that I had on hand. Ironstone, botanical transferware, brass candlesticks, pieces from my coral collections and a few bits from nature. Keeping it neutral and natural. We've been eating dinner in here more often which we all enjoy. Lighting the candles in the evening and really lingering, even if it's leftovers, has been a nice change. A couple of wonky unframed vintage paintings and my New Years tradition of paperwhite bulbs. There really is no easier indoor plant/flower to grow in my opinion. Vessel, rocks, water, bulbs, done. 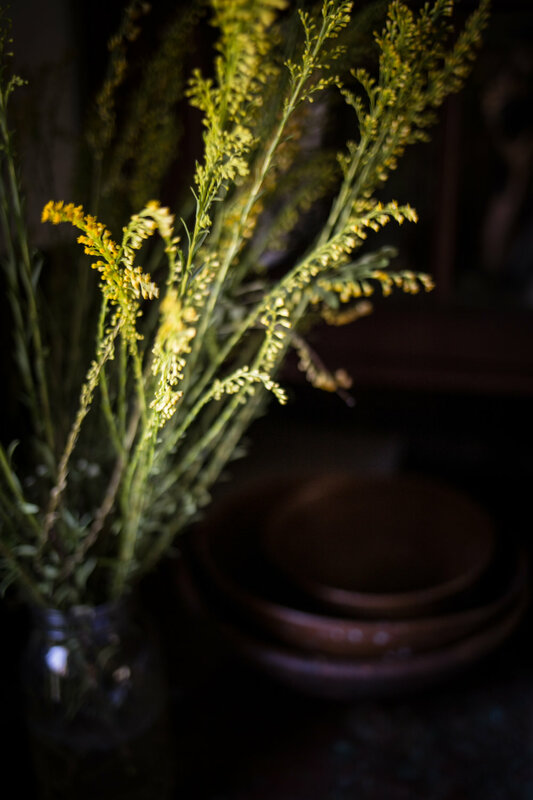 I usually get blooms in 2-3 weeks that are long lasting and very fragrant. I am loving how it feels in the room. The collections, the plants, the contrast of the white against the wall, the story behind the shelf. We went back to New England last summer for vacation for the first time since we lived there many many years ago. Full circle moment, I believe, is what this is called. It might be a good idea to start this post with a warning. "Caution: This blog post may produce extreme house envy. Symptoms include throwing out everything you own and starting over. Or hiring designer Holly Mathis. Or both." So perhaps it's best I don't share all the images just yet. It's for your own good. Trust me. This summer I did a little styling and photographed this beautiful home for Holly and absolutely marveled at the renovations that were made. This home, in a lovely suburban Houston neighborhood, got a major update with Holly's help which gives it so much style and personality. 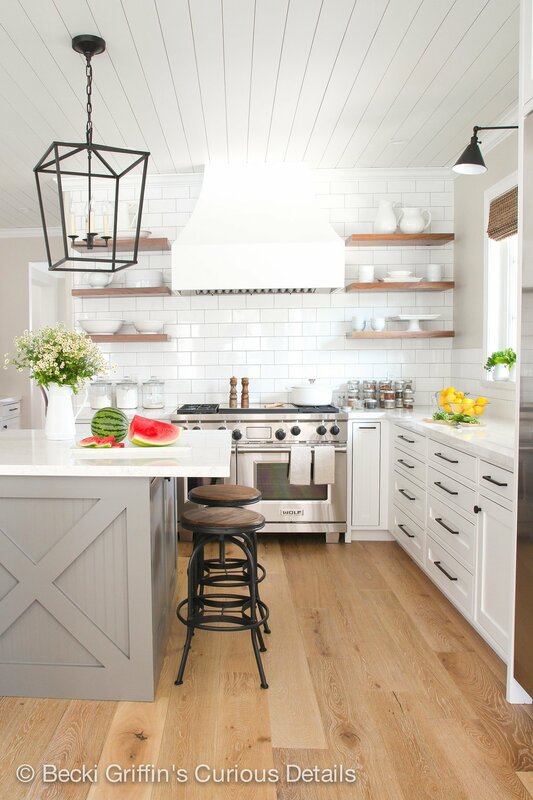 Cabinets were removed, a window added, along with shiplap ceiling, open shelves and beautiful finishes and lighting. The quartz countertops are gorgeous. This young family has 6 children including a brand new baby and the nursery is absolutely adorable. The strong lines and large scale of the Darlana lantern contrast beautifully with the white kitchen. Lighting by Visual Comfort through True Blue Home. The new quartz countertops are beautiful and extremely durable. A great choice for a big family kitchen. Smart spice storage is so simple and easy with 4oz spice jars. The family does have a television. It's hidden in the lower right cabinet and raises and lowers by remote. Genius! Beautiful details and fabric in these custom slipcovers by LS Slipcovers topping off the basic Henriksdal chair from Ikea. Buffalo check, polka dots, shiplap and tons of natural light pouring in to this nursery for brand new baby #6 for this family! Art from House of Belonging. Holly is sharing details and sources for this project on her blog so be sure to pop over. I'm sure she'll be happy to answer any questions you might have. My intent was to clean off the coffee table and edit down the things. But I love the things. All the things. Especially the little white ceramic flower my boys bought for me on one of their Target runs this summer. They're driving now *gulp* . They were so proud of their Nate Berkus choice. It was easy to make a fuss over it because its so "me" and it was so sweet to hear the boys talk about why they chose it. These boys have grown up shopping with me all over the city, so they're pros. But it's not just about the shopping or the thing they bought. For me it's a huge milestone for our boys to be out and about on their own, in their own car they helped pay for with their own money earned from hours spent lifeguarding. Shopping for their own school supplies. Growing UP. Thrift store brass, trendy and metallic. I love the heighth of the candle sticks and the little brass bowl holds river rocks from last years vacation to the Frio River. Books. Always Books for me. Something alive. My coleus was getting wild so I cut some stems for a favorite vase (this was also a thrift store find). The coleus clippings will stay alive a good long time and they were free. Coleus is so easy to grow indoors near a window so try some for fall. Antler shed because I love the nature. White ceramic flower from Target from my boys. Something personal and pretty. Coffee table styling is my favorite quickie to freshen up my living room. What's yours? Ahhhh, sweet summer how I love you. Mosquitos and all. The minute the boys walk in the back door from the last day of school, after the last final exam, may be my favorite day of the year. We did it! another school year in the books and we're ready for the sweet reward of sleeping in, swimming and spontaneous road trips. A porch, a pony and a killer view. We shot this on location at The Prairie in Round Top, Texas, which was the perfect backdrop for the talented cover designer Andrew Howard. Classic wicker, blue and white pillows, the perfect little antique tea cart (thank you Kuhl Linscomb) and painted wood tile flooring. That's Rooster the horse that lives down the road who came to visit on the day we shot. He's a big ol' retired rodeo horse that likes to munch on flowers so imagine us trying to distract him to get the shot before all the flowers disappeared. He was such a good boy and anytime we have a horse on set is a very good day for me. Stylist Tip: The pink flowers on the coffee table aren't flowers but blooms from a crepe myrtle tree. They're one of my favorite stems to cut and bring inside and are plentiful during Texas summers. In the June 2016 issue of Country Living is a sweet feature of the playhouse Houston designer Bailey McCarthy built for her daughter, Grace. The McCarthy's replicated the Texas dance hall Gruene Hall at their farm in Bellville. You can see more of this feature in the current issue and click here to see more images. Spending the day with these little cuties sure made me miss little voices and watching Grace belt out tunes from Frozen brought back memories of the shows my sister and I would put on. Anyone else big fans of The Partridge Family? Stylist Tip: Old fashioned root beer floats are so delicious and simple to make. We used Mug Rootbeer (no caffeine!) 2 scoops of vanilla ice cream, lots of whipped cream and a cherry on top. Tasty and super cute in vintage mugs from HASbins, the popup shop of my assistant and her partners. Chill the mugs before you make these to keep the floats nice and cold. I hope summer is good to you and that you get in lots of porch sittin' and ice cream eating and magazine reading. A year ago the fabulous team from Better Homes and Gardens paid us a visit to shoot a few rooms in our house for their spring garden issue. Photographed by Brian McWeeney and produced and styled by one of the best in the business, Janna Lufkin. The team, headed up by Shelley Caldwell of BH&G, pulled together a story that's true to me and my style and how we live in and enjoy our home. I am so grateful to them for this wonderful opportunity to be featured in the April 2016 issue of Better Homes and Gardens magazine. My personal style is a mix of custom pieces, vintage and fine art, personal collections and flea market finds. As beach lovers, our dream house would be a cottage by the sea with a killer view. Our reality is that we live in a typical builder house in the middle of suburbia. However, we live with the things that bring us delight and create an atmosphere that suits our home and lifestyle which keeps it from feeling anything but typical. That's also a philosophy I share with my design clients. The white slipcovers seen in the article are custom from LS Slipcovers in Houston, TX. I'm so in love with those slips. I know they're not for everyone and I get asked all the time how I live with white sofas and 16 year old twin boys. The truth is they're probably the cleanest thing in my house because the covers can be washed. Yes, they get Cheetos smashed into them and dirty puppy paw prints. But they come out of the washer looking brand new and smelling like Heaven. I couldn't do that with my old upholstered sofa's. Read more about the slipcovers here. Art plays a big part in my personal style. Antique botanical charts, pressed botanicals, and coastal paintings (some by me) mix with bead board walls to create the light and airy cottage look we love. Also included is the beautiful work of my dear friend, fine art photographer and mixed media artist Lori Vrba of Chapel Hill, NC. Don't afraid to mix and layer your art. In fact, don't be afraid of anything when it comes to decorating. Fear holds so many people hostage from simply enjoying their homes. Fear wastes so much time! I think fear is a decorating epidemic. I've worked with so many clients that are absolutely terrified of making a mistake or a choice that they stay frozen and never make any progress. They're worried about trends, or rules or what their mother-in-law might think. I want to give you permission to have fun with your home. Don't take it all so seriously. Have a little fun playing in your house. I approach decorating my own home like I would a styling job. Adding and editing as I go. Not everything works all the time. It's a process and I'm never done. And that's ok! I allow myself mistakes and time to enjoy the hunt for new things. I hope the story inspires you to live with the things you love and bring you delight as well. *You'll have to be a BH&G subscriber to enjoy this feature as it's not included in the newsstand version. You can also purchase a digital version of the magazine through their app in the itunes store. As much as I love to hold a copy of the magazine, I really enjoy the digital version as well for zooming in on details.